Last week I was invited to take the boys to an exhibit I KNEW would be a smash hit in their books... A LIVE frog exhibit at the Muzeo in Anaheim. Frogs: A Chorus of Colors will be running at Muzeo now through September 5, 2010. 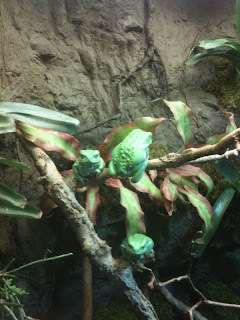 Over 150 LIVE exotic frogs are on exhibit. My kids really enjoyed seeing all the different varieties of frogs, and watching the movie about the race to preserve the frogs species with Jeff Corwin. I am very appreciative for the "virtual" frog dissection station (thank you for not making me re-visit high school Biology class...). There are 15 live frog habitats, 12 interactive stations and it's just plain cool! 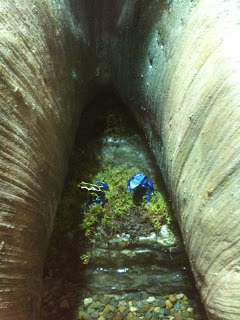 My two favorites were the Jabba (the Hut) frog and the colorful vibrant blue frogs. The world's largest frog is the Goliath frog of West Africa. It can get up to 7 pounds. You can see the skeleton of one on display at the exhibit. There is evidence that frogs pre-date the dinosaurs! There are more than 4, 900 species of frogs worldwide and they estimate that there are an estimated 1,000 more to be discovered. So if you're in Anaheim and looking for a way to spend a couple of hours on a fun but still educational adventure... pop over to the Muzeo. it is located at 241 South Anaheim Blvd., Anaheim, CA. Admission is $13 for adults, $9 for children 12 & under, and free for children under 3. It is open daily from 10 a.m. to 5 p.m.. For more information call them at (714) 956-8936 or visit their website. For more pictures, here's the Whrrl story we created about the event. Including photos of my boys getting to feed the frogs! Where on Earth Do You Find a Space Cake in OC? It's Bare Escentuals Lip Gloss Giveaway Time! Moshi Monsters at the LA Zoo?